When passed, the EU Goods Package, as the legislation is called, will have as far if not further ramifications to e-commerce than the move by some countries to reduce or eliminate deminimis thresholds. The traders that will be the most severely affected will be SME’s who sell online into the EU. Aside from added administration and compliance requirements it is projected that compliance will cost as much as Euro2,500 annually. In some cases, this could be the annual margins of SME’s who sell online. There is a little known compliance and enforcement legislation working its way through the EU system called the EU Goods Package. When passed, it will significantly limit the number of available goods in the EU goods market from suppliers outside the EU The premise behind this legislation is admirable and relevant as it seeks to strengthen controls by national authorities and customs officers to prevent unsafe products from being sold to European consumers. What the legislation also does is increase already steep compliance costs for third country manufacturers selling goods into the EU. 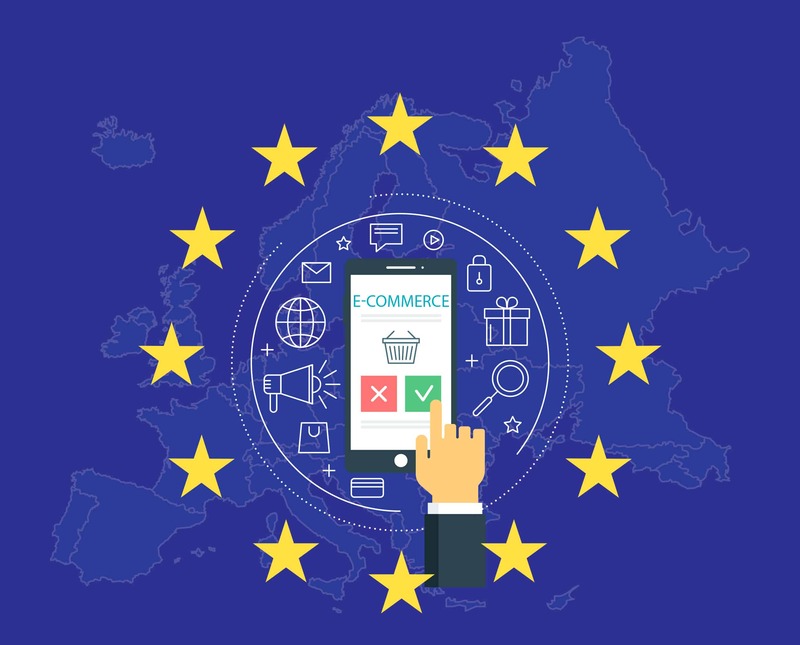 SME’s selling on their own website or e-commerce platforms may not be able to bear increasing compliance costs and will likely stop selling their goods in the EU. This will reduce products available to EU consumers, compliance costs will skyrocket and the internet and e-commerce in particular which was supposed to be the great enabler and provider of opportunities for SME’s will be significantly hampered in fulfilling on it’s promise. What is the EU Goods Package? The EU Goods Package is a program put forward by the European Commission containing two legislative proposals intended to strengthen the EU’s single market for goods by reducing the number of non-compliant products sold to EU consumers and making it easier for companies to sell their products across Europe. If approved, the EU Goods Package makes it necessary to have a “person responsible for compliance information established within the Union”. The responsible person’s task will be to hold product compliance documentation and cooperate with market surveillance authorities by answering their questions and take the necessary steps to remove non-compliant products from the market. The initiative if passed, will come into effect in January 1, 2020 and its main objective is to improve the functioning of the EU’s Single Market by increasing compliance with EU product harmonization and, conversely, reducing the number of non-compliant products in the EU market. Current control systems and enforcement tools are insufficient to track and deter the circulation of non-compliant goods and most of the problem, the EU claims, comes from non-compliant products from outside the EU – especially small consignments sold by manufacturers outside the EU through online platforms. Granted, tracking and intercepting non-compliant products and countermeasures are a challenge today. The very short supply chain between supplier and consumer and the high number of small parcels sold online make it extremely difficult for authorities to trace and intercept non-compliant products and market surveillance measures are extremely difficult to enforce if the manufacturer selling the products does not have an importer, distributor or authorized representative in the EU. The EU, have also stated that third country manufacturers have a competitive advantage over EU based businesses by not incurring compliance costs to ensure their products meet EU harmonization legislation. This creates an “uneven playing field” where third country manufacturers selling non-compliant goods enjoy significant savings, and as a result distort competition. How is it going to affect businesses? The EU Goods Package contains new requirements and incentives that will increase the operation costs of businesses selling certain products into the EU. The kicker though is the need to appoint a person responsible for compliance information. Diagram 1 shows how this requirement affects different types of manufacturers selling products in the EU. Under scenario A, when a manufacturer is based in the EU, the manufacturer does not need to appoint a person responsible for compliance. 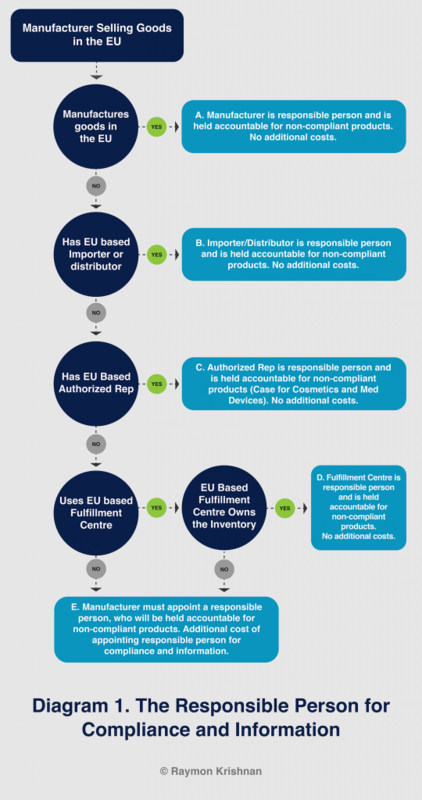 Under scenario D, when a manufacturer does not have an importer or distributor or has not appointed an authorized representative and uses a EU based fulfillment center that has purchased the products, the manufacturer does not have to appoint a person responsible for compliance and information. 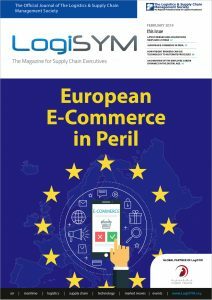 Under scenario E, when a manufacturer (i) uses a EU based fulfillment center that has not purchased the products or (ii) sells directly to EU consumers, the manufacturer would have to appoint a responsible person for compliance information. Moreover, the legislation does not clearly specify under which scenarios this type of fulfillment centers can be held liable for non-compliant products they offer or ship. The EU’s assessment estimates the cost of appointing a responsible person at between €360 and €1500 per year per business, the same assessment estimates that the costs of demonstrating compliance under the EU regulations at €1,807.41 per company per year on average. The EU Goods Package increases already steep compliance costs for SME’s selling online, especially those who have not designed their products for the EU market. This will therefore significantly reduce the number of products sold into the EU, especially products sold by SME’s outside the EU as it quite unlikely that most Asia based manufacturers selling lower risk products like toys, textiles, footwear through website or e-commerce platforms, design and manufacture those products to comply with EU regulations, standards and requirements. This legislation is also likely to affect the operation costs and the volume of products sold by EU based fulfillment centers. Fulfillment centers that purchase and distribute small consignment from third country manufacturers will face higher compliance costs. Under the legislation, they do not only need to ensure that all products meet EU harmonization legislation, but will be liable for any instances of non-compliance. As a result, they will likely stop selling any products that are not guaranteed to meet all EU harmonization standards. On the other hand, fulfillment centers that do not purchase their inventory—this category includes most online marketplaces—will likely see a significant drop in the number of third country goods that can be sold in the EU. Compliance costs, could be reduced if the EU capitalizes on emerging commercial opportunities. For example, under the right incentives, large logistics service providers or the marketplaces themselves could offer compliance and responsible person services to third country manufacturers at a lower cost. The EU has the capacity to build an incentive environment that encourages the growth of this type of services. For instance, the implementation of a policy like the U.S. Know Your Customer (KYC) scheme, under which a 3PL can declare on the manufacturer’s behalf, would allow 3PL’s to offer compliance services to their customers. However, it should be noted that schemes like KYC would mainly benefit manufacturers selling goods that already meet most of the EU’s safety and environmental standards and requirements. What is alarming to see and what prompted this article and other efforts to raise awareness of the EU Goods Package is that in a straw poll we conducted in December, almost no one had even heard of this impending legislation. When business leaders of the 3 largest courier companies globally were asked what they were doing to prepare for this and assist their customers, one had not even heard of this initiative and one responded rather flippantly that they would simply pass the costs on to their customers and would only look at it more seriously “when the time comes”. Well the time has now come. It looks like the legislation will be passed in a matter of days or would have already been passed by the time you read this article. Implementation will soon follow and organsiations and companies need to engage with regulators in the EU to ensure what eventuates causes the least amount of disruption and allows SME’s especially, to continue selling into the EU. We should also take it upon ourselves to help promulgate awareness of this far reaching legislation to help ensure minimal disruption to supply chains regionally ‘when the time comes’. 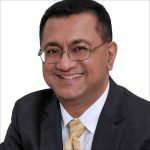 Dr. Raymon Krishnan, is President of the Logistics & Supply Chain Management Society and Secretary-General of the Asia Business Trade Association. 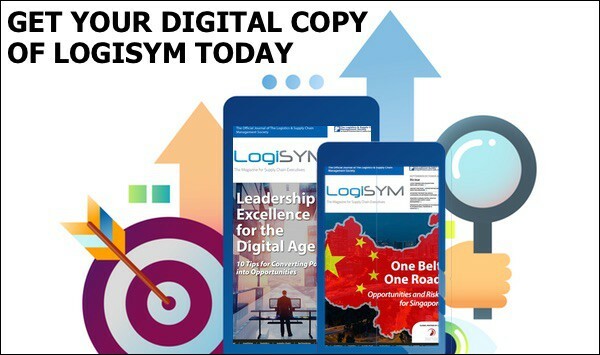 He is the region’s thought leader in Logistics, combining in-depth capability in designing and managing some of the most dynamic supply chains globally over the past three decades with a strong commercial slant, promulgating the dissemination and adoption of leading edge and practical solutions to improve Supply Chain performance.